Create and retain customer loyalty & satisfaction. Managing your customer information is essential to maintaining customer loyalty. Managing your customers and their equipment is easier than ever before with the new customer dashboard and photo management features. Easily manage your customers with multiple addresses by creating as many locations as necessary under their account complete with separate sets of contacts! With our new customer dashboard, everything you need to know about your customers is right at your fingertips! View billing and service history, notes, and contact information all in one place. Each customer is unique and so is their equipment. Now you can keep track of everything your customers have installed with our new equipment management system. Store your customers' credit card information with the confidence that it is perfectly secure and safe. Our new credit card vault system keeps your customers' credit card info safe and sound. Your customers are your biggest asset, so why not reward them for their loyalty? With Pool Program 8 you can do just that with our customizable customer rewards program! Seeing is believing, so why limit yourself to text-based descriptions of your customers' equipment? 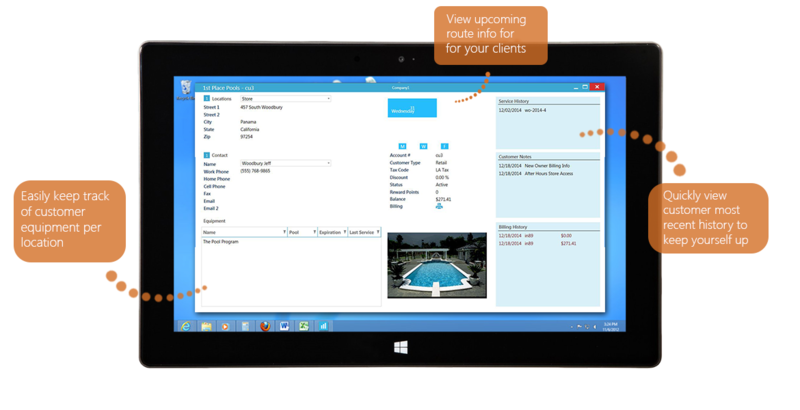 With Pool Program 8, you can add as many photos as you like to each of your customers' locations!